I think it will look wonderful on him. I hope to finish it soon. I'm crazy. I must be because I've joined a KAL (knit-along) to knit 52 pairs of socks in one year. 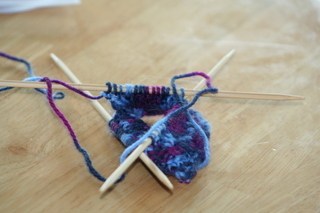 The idea is to knit one pair a week. I know I won't make the full 52 pairs, but it will be fun to use up all that sock yarn I've purchased. And, it means I can get more (don't read that sentence, Ben!). I'll be posting pictures as I go along.